If you go far enough back in the history books, my uncle was a Georgia Bulldog back in the 1960s but I am the first person in a long time that has attended the University of Georgia. However, I am proud to say that I have now converted my entire family into UGA fans. I have even been lucky enough to have my brother, Spencer (2022), join me here at UGA. Both of us are now trying to convince Satchel, my youngest brother (2024), to complete the trifecta. My achievements represent a culmination of the people, experiences and constant reflection with God and other mentors that have all molded and shaped my experiences here at UGA. Thank you to everyone who has helped, taught, scolded or mentored me throughout the years – because all of you are the people who have made a difference in my life. My time at the University of Georgia has been a constant time of growth. This journey has been filled with many more failures than the number of successes that I have listed here. But every time I fail, I must constantly remind myself to keep pushing to learn from these missteps. Since my freshman year, I have been working in the Exercise Muscle Physiology Laboratory under the direction of Kevin McCully. Together, we studied many topics, from non-invasively determining muscle fiber types, to developing a new streamlined muscle mitochondrial capacity test, and determining the applicability of endurance and mitochondrial capacity measurements in clinicals populations. With this experience, I have accomplished wildly more than I ever thought I would when I started this research. I have presented at multiple conferences and the final edits are being placed on my first published paper – in which I am the first author. The fact that I have had these opportunities as an undergraduate student is not lost on me and I am grateful. I would also be remiss if I did not thank the CURO office, led by Maria Navarro and Kerrie Bethel, who have helped me extensively and have been a phenomenal support system in accomplishing my undergraduate research goals. I have been lucky enough to study abroad twice while I was in college. Freshman year, I studied tropical ecology in Costa Rica where I studied ecosystems in a diverse and intricate climate. This experience allowed me to study a field that is not directly associated with my major and therefore represented the “gold standard” of the university system: learning for learning’s sake. I was also honored to be a participant in the Honors International Scholars Program, which allowed me to intern and research in South Africa for seven weeks. While there, I worked in the Heideveld Community Health Clinic shadowing and learning from local physicians. These health care professionals were absolutely incredible in their determination to provide care despite having limited resources. Within this system, I observed the benefits and challenges of the South African health care system. This information has helped me pinpoint what aspects of health care I want to work on in the future and how many of the systems of health care work worldwide. I have been involved in the UGA Student Government Association since my freshman year when I was appointed a Freshman Board senator. Freshman Board was an incredible group of people who I still consider to be some of my best friends. I have been blown away by all of their passions, successes and how they are still incredibly caring individuals. After my freshman year, I was honored to be elected as both a senator for the Franklin College of Arts and Sciences as well as the president pro-tempore of the Senate. I have since served in this position for the past two years. In this capacity, I promote initiatives, learn how the university functions, and most importantly, serve the student body. SGA is filled with passionate and driven individuals that have the best interest of the student body at heart. I also joined the UGA club swim team, and I will be the first to tell you, they are incredibly crazy but genuine people. Since freshman year, this athletic endeavor allows me to travel and compete at other elite universities throughout the Southeast creating memorable experiences along the way. Additionally, my college experience has been enriched by my involvement in Alpha Tau Omega, Shop with a Bulldawg, the University of Georgia Honors Program, the Reformed University Fellowship and the Tate Leadership Scholars Program. All of these opportunities have been made possible through the generous support of the state of Georgia through the HOPE and Zell B. Miller Scholarships and the University of Georgia through the Charles McDonald Brown Scholarship. … Dr. Sam Richwine, who is an unapologetic UGA alumnus and even more caring individual, offered to take me to dinner and to talk about UGA. If there is one thing I have learned in college, never refuse a free meal. 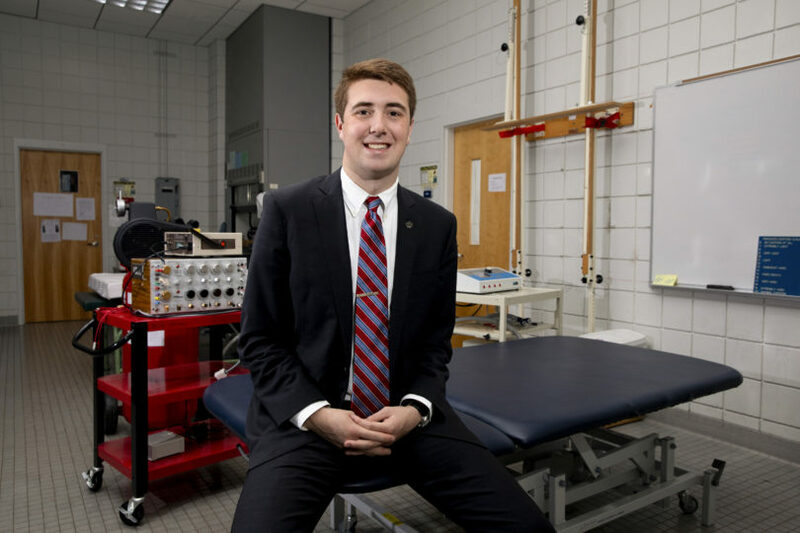 But Dr. Richwine also had a card up his sleeve — he brought Carter Galbraith (another UGA Amazing Student from March 2013). During this dinner, we talked about my aspirations and all that UGA had to offer. After that night, I was put in touch with a couple of amazing people who helped me feel like I was at home even before I enrolled as a student. Lakecia Pettway, the recruiter for the Honors Program, made me feel special, useful and cared for, and that was the difference that I felt at UGA. Professor Karl Espelie, an exceptional mentor, met with me as a high school senior and influenced me with countless stories of students who have succeeded here at UGA. All of that is to say that UGA has a vast number of statistics and bullet points on why it is great. However, I will always argue that the people that make up the community of UGA truly make the difference and cemented the beginning to this amazing journey. I like to start my days is by going on early morning runs through campus. It is an incredible feeling to be up before everyone else is awake and just to be running through all of campus when the sky is an incredible shade of deep red just awakening from black. Hitting the high points of campus helps keep me sane and reminds me why UGA is such a wonderful place. … to call a friend randomly (normally someone I haven’t seen in a long time) and do something completely off the cuff. In that moment, we can escape the horrors of cramming on an orbit bus or trying to run to class and instead enjoy the company of each other. While interning in South Africa, a group of friends and I decided to take a Garden Route trip. If you are not familiar with South Africa, the Garden Route is a stretch of coastal road spanning the southeastern part of the country. Along the road, there exist an abundance of lagoons, lakes, mountains, forests and beaches. On this trip, we collectively decided it would be a great idea to bungee jump off the Bloukrans Bridge — the highest commercial bungee jump in the world. And let me tell you, it is all fun and games until you are standing on the edge of a 216-meter-tall bridge and all that is supposed to catch you is a tiny piece of rubber that is the size of your wrist. When you get to the edge, you can’t think — you just have to jump. All I can tell you is my prayers were answered and I am still here to tell the tale. This is easy: Science Library, fourth floor, six rows down on the left side, back corner, right table. I have immense appreciation and admiration for Kevin McCully, the principal investigator of the Exercise Muscle Physiology Lab in which I have worked since my freshman year. He is immensely kind, driven, and I am blessed to consider him an incredible mentor. Dr. McCully deeply cares about his students and his research and I will be forever grateful for the opportunities he has given me, such as leading my own project within the research lab or going to numerous conferences. But beyond the academic side of the lab, Dr. McCully is never short on personal advice (which I seek often) and is always willing to go the extra mile for me and the numerous other students who work in his lab. I will also be forever indebted to Karl Espelie, who took me, even as a high school senior, under his wing and helped me plan this amazing experience here at UGA. The countless trips to the Grit, sneaking in to his BIOL 2990H seminar (even when I am not in the class! ), and the numerous hours in his office have all taught me how passionate and caring Dr. Espelie is toward his students and helping them achieve their goals! Dorothe Otemann. Where do I even begin. Dorothe is by far one of the most incredible and kind people that I have ever interacted with. She tells it like it is — which is simultaneously scary and encouraging. I will never forget the countless conversations that we have had in your office or grabbing a quick lunch downtown — as these conversations helped shape me into who I am today. Another professor (and now administrator) who has had an immense impact on my life is Maria Navarro. Dr. Navarro taught the first class I walked into at UGA. In a matter of minutes, I knew I was in the right place. Since that day, we have had countless interesting, reflective and constructive conversations. I am incredibly thankful for the impact and care she has shown in my life. Additionally, I am grateful for the entire Honors Program staff, specifically David Williams, Maria Navarro, Dorothe Otemann, Maria de Rocher, Jessica Hunt, Lakecia Pettway and Elizabeth Hughes, who constantly help open doors for me. There are numerous other faculty and administrators that have made an impact on me during my time here at UGA: Taylor Cain, Dr. David Hall, Dr. Randy Hammond, Dr. Scott Connelly, Dr. Andrew Mehring, Dr. Phil Holmes, Dr. Richard Morrison, Dr. Doug Jackson, Dr. Gregory Robinson, and Dr. Kacy Welsh – thank you for opening my eyes and being great professors who care about the success of your students. I would also be remiss if I were not to quickly thank the numerous graduate students who have impacted my college career – Juliano Saccomani, Eva Fernendez, Tyler Nungesser, Brian Garsh, Jackie Phillips, Nicholas Twiner and Patrick Doyle – thank you all so much for the time and caring that you gave to me. I truly appreciate all the work that you all do. … create a system where all people could have the access and ability to receive preventive health care. Our current health care system is mainly focused on disease treatment rather than disease prevention. Many modifiable risk factors for chronic diseases are not being addressed adequately by our current system. A prevention model, focused on stalling the development of disease before symptoms or life-threatening events occur, is the best solution to solve the current disease crises, such as cardiovascular disease, cancer and diabetes that our country currently deals with. If this system could not fail, it would allow us to defeat many of the societal health problems we currently deal with. My passion is to learn people’s stories. I do this through an extensive amount of reading and listening. But I believe the most important (and coolest) way to learn people’s stories is to sit, listen and interact. I love to have meaningful conversations and learning about what drives and motivates people. … pursue an M.D. along with an additional degree of either an M.B.A. or an M.P.H. with an emphasis in public/global health. With this, I hope to understand the complexities of providing medicine in the 21st century and how health care is scientifically and socially administered to diverse populations. Ultimately, I plan to pursue a career as both a physician and a health policy expert who attempts to improve the efficiency and productivity of our health care systems. While I have so many incredible memories from my time here at UGA, ranging from being way too loud in the science library to hugging Ms. Sandra every time I walk into Snelling, I feel like one memory sticks out in my mind: winning SEC Championship against Auburn! I can just remember wildly jumping around and immediately running to the fountain to celebrate. I have never seen more happy Georgia fans in one place — all of Herty Field was covered with UGA students. We stayed there for hours. It honestly looked like a scene from a movie. That night constantly reminds me why I love to go to school here and is just one more reason why we go to the best university in world!